At least once a week I receive a notecard from a customer wanting to know what this hairstyle is--it appears on many of my vendor photos because I enjoy wearing it. It's really beautiful, isn't it? (Actually, I was shopping one day and noticed a lady with this hair, and I just HAD to ask her where she got it. Funny!) It's Dina from Emo-tions Hair. OK, now let's play a bit of catch up on the petite jewelry available @ PETITE ELEMENTAL JEWELRY, and, of course, it's all available at "biggie" ELEMENTAL JEWELRY as well. Above is the Petite Adriana Necklace & Earrings in Lights--Peridot (shown above), Turquoise, Blue Moonstone, & Rhodochrosite, Silver or Gold, all in one texture-changing set. I really like this set as it's a bit different, not a pendant or choker, more like a showpiece to set off any neckline. It's also available in "Brights"--Amethyst, Spiderweb Obsidian, Amazonite, & Red Abalone. I couldn't resist including this shot. I'm at The Noble Storybook sim, a magnificent tribute to Beatrix Potter, and I'm standing on her desk! How great is that for a little fairy? Oh, and the jewelry--The Petite Kira Necklace & Earrings in "Cools"--Purple Agate, Sugalite, Peacock Chrysocolla, Turquoise, Blue Chaldedony, and Moonstone with Gold, Silver, & Black metal. Also in "Warms"--Fire Opal, Fire Agate, Red Lace Agate, Amber, Ruby, and Red Italian Glass. I have to tell you, this was a pain to adapt for petites. LOL. But, I think it was worth the effort. And, below, The Petite Lilliana Necklace & Earrings in "Classics"--Ruby, Lapis Lazuli, Onyx, & Maw Sit Sit. Also available in "Lights"--Rutilated Quartz, Pink Opal, Chrysocolla, & Ammolite--and "Brights"--Coral, Blue Jasper, Chrysoprase, & Charoite. This one is really pretty and quite versatile. I've worn it with casual clothes, evening clothes, and when I'm a fairy. Eyes: Mayfly--Deep Sky Eyes in London Fog. Freebie--Thanks! These are currently my favorite eyes for both my big self, and my petite! I have purchased them in many shades. Green Dress: Kastle Rock Petites--Silk Flower Gown in Martini Olive. Purchased on sale. 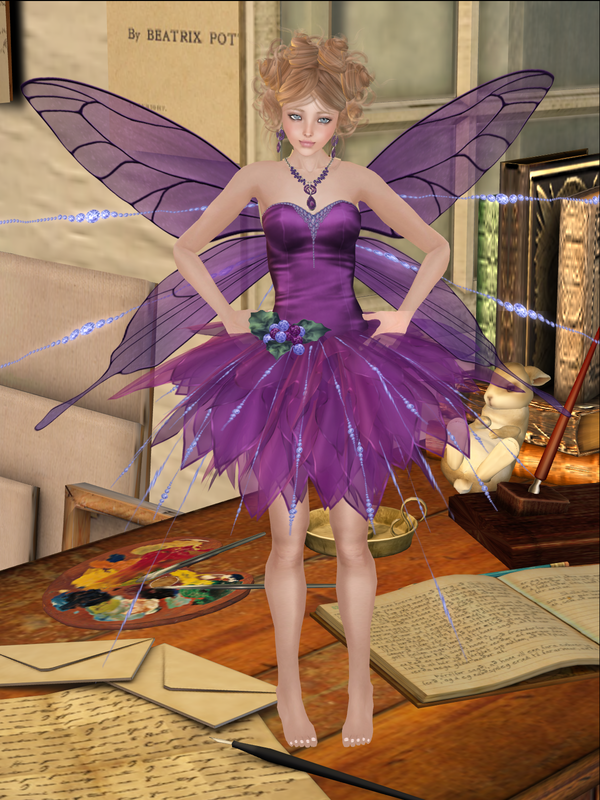 Purple outfit: G Field--Crystal in purple. I think this was a hunt gift, or maybe a subscriber gift. Thanks! Red outfit: G Field--Fairy Dress in red. Purchased on sale.